Belvoir Castle01476 871002work CastleBelvoir Castle, was built during the Regency period, and is home to the Duke and Duchess of Rutland and is open to visitors. The Castle houses many treasures collected throughout the ages and boasts one of the largest private art collections in the country. The Castle contains many pieces of fine French furniture, Italian sculpture and magnificent tapestries. Inside the castle are many notable collections, from the military treasures in the guardroom to the stunning staterooms with their impressive period art, tapestries, furniture and sculpture. In contrast to the grandeur of the State Rooms, the Old Kitchen and Bakery will fuel your imagination of 'below the stairs' life in 1825. The School Room and Nursery are well equipped for children to experience lessons and play in Regency times. 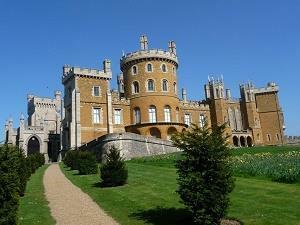 Belvoir Castle, was built during the Regency period, and is home to the Duke and Duchess of Rutland and is open to visitors. The Castle houses many treasures collected throughout the ages and boasts one of the largest private art collections in the country. The Castle contains many pieces of fine French furniture, Italian sculpture and magnificent tapestries. Disabled access is limited to the ground floor, however most of the rooms on view are situtated on the ground level. Stewards restaurant is open throughout the season. Please see our website for days when we are open. The Castle may be closed for events or location film shoots so please choose your date of visit carefully. Take the A607 to Grantham from Leicester, from here it is well sign posted, follow the brown and white tourism signs.